With the boom in Croatia's tourist trade, there's hardly an airport that isn't undergoing expansion, alteration or renovation. And that's a good thing! (Although, it may not seem that way if you arrive during a construction operation). 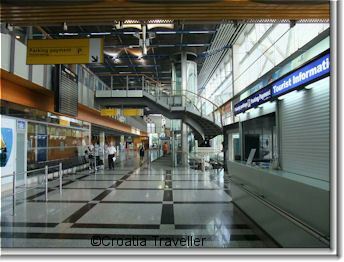 The fact is that Croatian airport design is functional, efficient and boring. Shopping is minimal, dining facilities are basic and there are few comforts available in the waiting areas. In short, you'll be happy to leave. 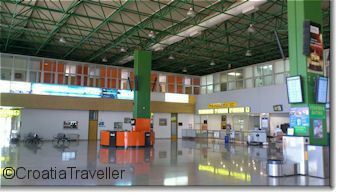 As least the surface areas are small making it easy to find your check-in desk and departure area. And, yes, you can do the most important thing which is get money through an ATM or exchange foreign currency. Another positive feature of Croatian airports is that they are a reasonable distance from town. If you mess up on public transport, a taxi is not ruinously expensive. (Code: DBV) Busy, busy, busy, this airport on the very southeastern tip of Croatia has flights all year to the UK, Germany and other European destinations as well as to Zagreb. More. (Code: OSI) Nearly destroyed in the early 1990s, this airport is the central hub for visiting eastern Slavonia. Domestic flights link it to Zagreb, Split and Dubrovnik. (Code: PUY) This small airport is the gateway to Istria with flights to Zagreb, charter flights in the summer to the UK and often has regularly scheduled seasonal flights to Russia, Germany and Serbia. (Code: RJK) Located on Krk Island, this airport is struggling to maintain viability. Summer flights to London help bring visitors to the Kvarner region. (Code: SPU) This busy airport near Trogir is an important gateway to the popular islands and coastline of southern Dalmatia. More. (Code: ZAD) This airport is zooming up in importance as the Zadar region attracts more and more visitors. More. (Code: ZAG) Also known as Pleso, this airport is Croatia's major gateway with flights year-round to local and international destinations. More.